Last week I showed some pictures of Rolduc. Today's pictures are taken only about 1500 meters from there. In the old days Kerkrade and Herzogenrath were one community, 's Hertogenrade. Most important buildings were Rolduc Abbey and the castle only a few hundred meters apart. During the Vienna Congress 1814-1815 new boundaries were formed in Europe. One of the results was that the town of 's Hertogenrade were split into a Dutch and a German part. Kerkrade in the Netherlands and Herzogenrath in Germany. Just like that and never mind the feelings of the people concerned. 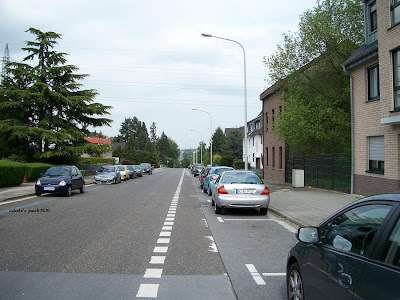 The new frontiere line was drawn right in the middle of a street, the Nieuwstraat (New Street) and was marked with barbed wire, poles, chicken wire etc. What I remember as a kid after WW2 was that an aunt of mine lived in the German part of the street and for every visit we had to pass through customs and show passports. A few decades ago with a united Europe to come the wire and poles were pulled down and low concrete frontiere was built. People who lived in the street got a special passport to cross the street both ways. In 1991 the concrete border was removed as well and no boundaries are left. My aunt and her family lived in the house at the left. At the opposite side of the road schoolfriends of mine lived. When visiting my aunt I could not cross the border to play with them. I was not even allowed to go near the wire fence to talk to them. Now it is just one open street as you can see. 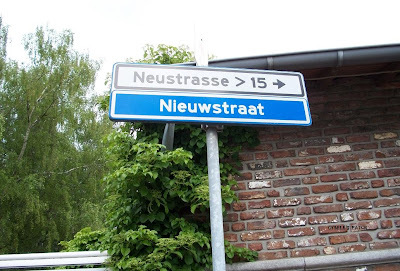 The streetnames in both languages. The sign is placed in Germany and where I stood to take the picture is Netherlands. There where the Dutch part of the street ends a new building was constructed about 10 - 15 years ago which accommodates German and Dutch offices. 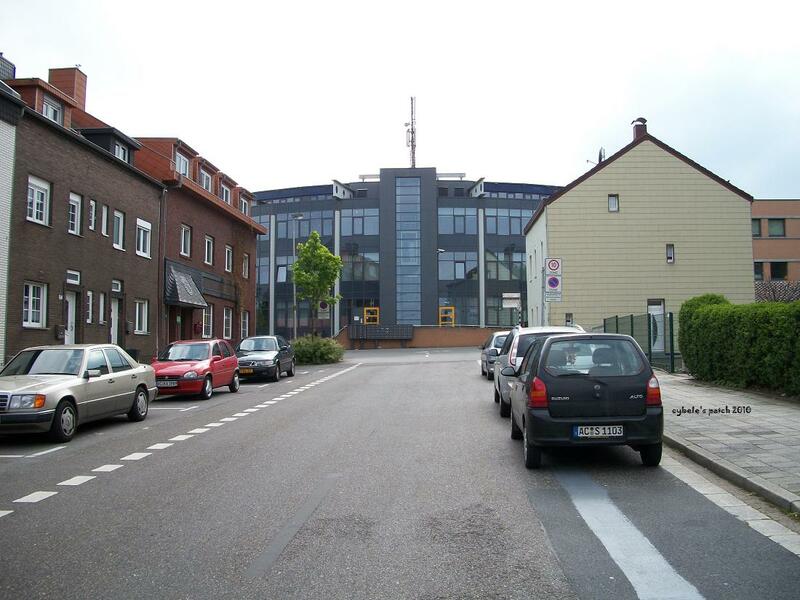 I think it is an ugly monstrous building and divides a street that onze was several kilometers long and straight. Don't know who's idea it was but I have not met anyone who is happy with it. 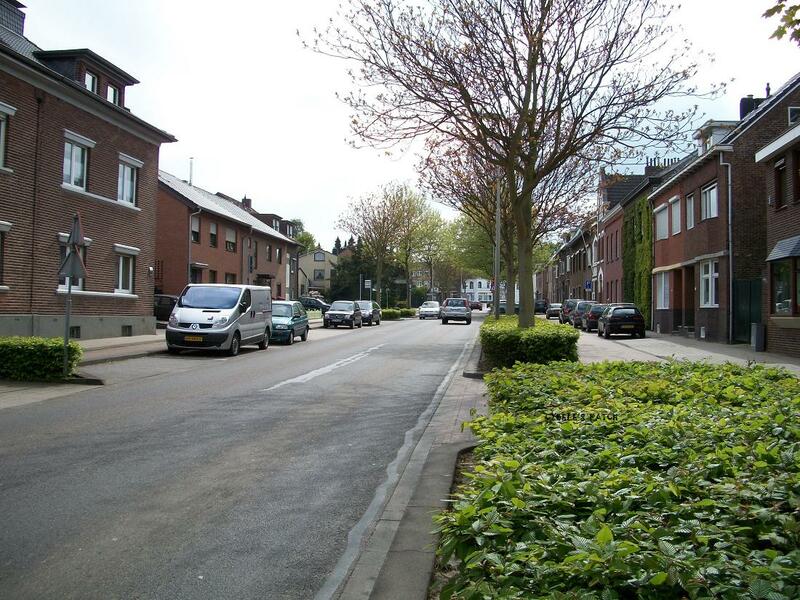 The house at the left is the last house of the Nieuwstraat on Dutch territory. This picture is taken at the back of the hideous building. From there the street is German at both sides. I find it so amazing that they would divide a city like that, but then who knows what or how politicians think????? Lovely photos and it does look peaceful now. Very interesting post for the day! Hope the peaceful feelings remain! Have a great week! Interesting post from your world. That must have been so hard to need a passport to visit your Aunt. Amazing to think about borders dividing a street. I'm glad it is open now. Jossie, these street shots are great. You should include this post in the new Everyday Life meme. The theme this week is 'A street scene of my village/town'. Thanks for the comments on my blog. The pool enclosure has bars to keep the sharks out. You can probably have a closer look in the shot I posted yesterday, from the boardwalk above the bars, with views towards Point Piper. That is a truly amazing piece of history. Thanks for sharing it with us. Very interesting and beautiful place. Surprised to see Dutch on one side of the road and German on the other side of the same road. I wish there were no walls between countries, how do you explain to children: this is mine or ours and that is theirs? Gelukkig is het nou allemaal vrij. Wat een ellende moet dat zijn geweest in die tijd. Mooie foto's. Very interesting history here. So glad the boundaries are gone but sorry to hear no one is happy with the monster building. It seems monster buildings everywhere are not well accepted due to their size and general lack of beauty. Some borderlines are really "funny" I know one which went through a house at the Belgian/German border. The kitchen was in Belgium and the bedrooms in Germany. I don't know if they needed a passport to go from the kitchen into their beds. It sounds like a joke, but your story doesn't surprise me at all ! Only that it lasted til 1991 ! Where culture, language and politcs meet, there is often conflict brought on from governments in other cities. I'm glad there is freedom to visit friends across the street now. The farms and abbeys are beautiful! fascinating history. It's amazing that you were a part of it too. A nice street. Very clean. borders are fascinating for me! great post!